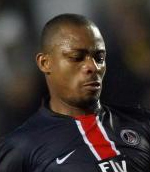 Portsmouth are believed to be among the admirers of Paris Saint Germain forward Bonaventure Kalou. The Ivory Coast international could leave the Parc des Princes in the summer, and is unlikely to be short of suitors. According to L’Equipe, Portsmouth are very interested in Kalou, the older brother of Chelsea striker Salomon Kalou. The 28-year-old still has two years to run on his existing deal at PSG but could head for pastures new as early as this summer. Pompey chief Harry Redknapp is keen to strengthen his squad and the former Auxerre man could be targeted.